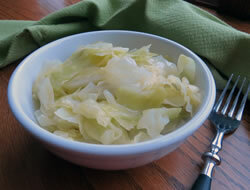 Shredded cabbage with a cheese and creamy sauce make a rich and savory side dish. Spray a large skillet with non stick cooking spray. 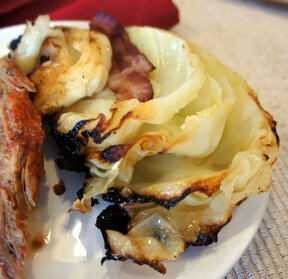 Add the cabbage, carrots and onions to the skillet. Sautee the vegetables until softened, approximately 10 minutes. Pour the vegetables into a 2 quart casserole dish. 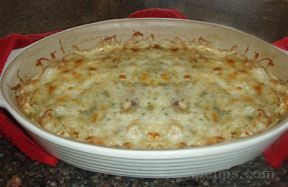 In a small mixing bowl, combine the eggs, milk, seasoning salt, parsely and swiss cheese. Stir to combine and then pour it over the vegetables. 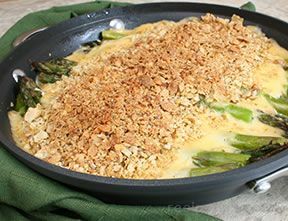 Sprinkle the top with paremsean cheese and place in a preheated 350° F oven uncovered for 35 minutes or until golden brown and bubbly.